Greek mythology is rife with beasts and fantastical creatures. Among them is the many-headed serpent known as the Hydra, which had the remarkable ability to regenerate heads it lost in battle. Many creatures of ancient lore can be representative of real-life experiences. In the case of the Hydra, some see it as the embodiment of problems that are both complex and continually changing. Unfortunately, cancer is a very complex and adaptable disease that fits the mold of a modern day Hydra. For the Greeks, Hercules managed to conquer the Hydra. For us, the fight against cancer is still ongoing, but many forms of it are now treatable thanks to the herculean efforts of Dr. Jane C. Wright. Cancer is a disease unlike most others. In essence, cancer occurs when a cell begins to duplicate itself uncontrollably1. Cell duplication is a delicate process that requires tight regulation. In order to make copies of itself, a cell needs to copy the entire genome, one base at a time. This is a very error-prone process which can result in cancer-causing mutations if the errors go uncorrected1. Typically, cancer cells have lost the ability to control cell duplication and are no longer able to correct certain types of errors. Because of this, each time a cancer cell duplicates itself, there is a chance that the duplicate cell will have new mutations in it. Depending on the mutation, it can give the new cancer cell some selective advantage that allows it to continue growing when others couldn’t. The end result of this microevolution in cancer cells is that they are continually changing; treatments that kill one cell may not work against another. In the early to mid 1900s, cancer was typically treated with a combination of surgery and radiation2. Surgery can be a very effective treatment, but for many reasons some tumors are inoperable. Radiation is a common treatment which works by bombarding cancer cells with energetic radiation that wreak havoc inside them. These waves cause large amounts of damage to a cell’s DNA, proteins, and other vital structures. While effective, some cancer cells are able to survive the onslaught and may regrow the tumor in a more aggressive way3—not unlike a Hydra that has lost a head. Surgery and radiation were the best treatments we had for a long time, until scientists like Dr. Wright came along. 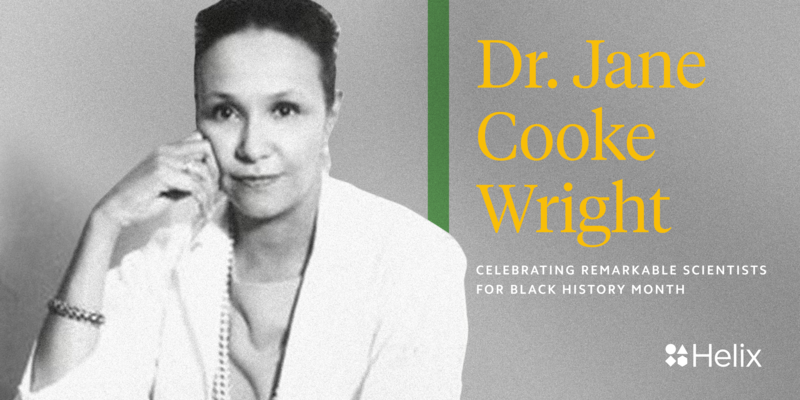 Dr. Wright graduated with honors from New York Medical College in 1945 and began research in 1949 in her father’s lab at Harlem Hospital Cancer Research Foundation. There, she and her father pioneered cancer research by demonstrating that tumor cells could be removed and studied in the laboratory as a way to understand which therapeutics would work best for a particular patient4. Although it’s not perfect, growing cancer cells in the laboratory can give researchers a unique look at how cancer cells behave and what treatments they might survive3,5. Similar techniques are routinely used today and serve as a foundation to therapeutic development5. Dr. Wright and her father appreciated that radiation and surgery were not always good enough and that there was another option: chemotherapeutics. Chemotherapy refers to the use of chemical agents (drugs) as therapeutics. Dr. Wright and her father were among the first researchers to try to predict chemotherapeutic effectiveness based on tests using cancer cells in the lab2. In the course of their research, they identified several new therapeutics that could be used to treat cancers like Hodgkin lymphoma, chronic myelogenous leukemia, and others. Some of the therapeutics that Dr. Wright and her father discovered are still used to treat patients today2. Additionally, Dr. Wright was a strong advocate for the use of combination therapy in which multiple therapeutics are used in a precise order. She understood that cancer was ever changing and they needed a multi-pronged attack in order to deal with it. Though it was not common at the time, this is a regular practice in modern day medicine. It is difficult to succinctly communicate the immense impact of Dr. Wright’s work. In a very real way, Dr. Wright helped develop many of the tools and therapeutics we use to fight cancer today, impacting countless lives along the way. Over the course of her career, Dr. Wright authored more than 135 scientific publications, was honored with a presidential appointment to the Commission on Heart Disease, Cancer, and Stroke, received numerous academic awards, and inspired generations of researchers. Cancer is still far too common, but thanks to researchers like Dr. Wright, we are closer than ever to beating it. 1Hanahan, Douglas, and Robert A. Weinberg. “Hallmarks of Cancer: The Next Generation.” Cell, vol. 144, no. 5, 2011, pp. 646–674., doi:10.1016/j.cell.2011.02.013. 2Swain, Sandra M. “A Passion for Solving the Puzzle of Cancer: Jane Cooke Wright, M.D., 1919-2013.” The Oncologist 18.6 (2013): 646–648. PMC. Web. 26 Feb. 2018. 3Riffle, Stephen, and Rashmi S. Hegde. “Modeling Tumor Cell Adaptations to Hypoxia in Multicellular Tumor Spheroids.” Journal of Experimental & Clinical Cancer Research : CR 36 (2017): 102. PMC. Web. 26 Feb. 2018. 5Lovitt, Carrie J., Todd B. Shelper, and Vicky M. Avery. “Advanced Cell Culture Techniques for Cancer Drug Discovery.” Biology 3.2 (2014): 345–367. PMC. Web. 26 Feb. 2018.